Greetings in the majestic name of our Lord Jesus. I hope this communication finds you well. As I write this letter, the United States of America has just moved their embassy from Tel Aviv to Jerusalem. Seventy years earlier on this day, May 14, 1948, marked the rebirth of Israel. The United States also played a big role on that day. President Harry Truman walked down the aisle of the United Nations with Israel’s first president, David Ben-Gurion, to give our country’s full support of Israel becoming a nation after almost 2,000 years of exile. 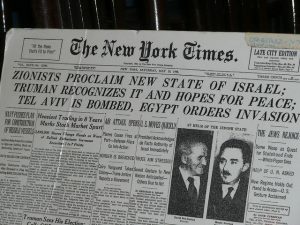 Seventy years ago, God’s time clock for Israel began to tick again. Prophecies from Isaiah, Zephaniah, Ezekiel, and others started to be fulfilled with great speed and accuracy. These prophets prophesied a nation (Israel) would be born in a day, and it would be a nation not desired by the world (Isa. 66:8; Zep. 2:1). Ezekiel spoke of the tremendous noise and commotion it would make when he had the vision of the Valley of Dry Bones coming together again (Ezek. 37). Since that day in 1948, Israel has faced much opposition and noise. By declaring their independence, the Arab world around them declared war on them. Israel was on the front page of world news then, as they are today, with one nation standing by their side—the United States of America. However, another, even stronger than the United States, stood up in those days. 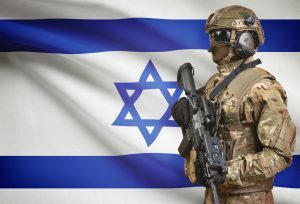 The archangel, Michael, stood up to watch over the people of Israel in a time of trouble they had never faced since ceasing to be a nation in 70 A.D.—the Holocaust of World War II. Michael has not sat down since! Israel defeated the Arab world without an army in 1948. As other conflicts arose, Israel, who was outnumbered and out-armed, still defeated enemies seeking to annihilate them with angelic help. God also sets kings into office, which includes presidents and other leaders, and uses them to forward His eternal plan (Dan. 2:21). Donald Trump has been used by God to reaffirm that Israel is a nation that is here to stay—never to be plucked up (Amos 9:15)! The moving of our embassy to Jerusalem enforces the fact to Satan that Israel, God’s people, is back—Jerusalem is theirs and God’s forever! This bold move has stirred up the devil as in 1948. As such, demon-driven people are clamoring, which Jesus described as the seas and waves (people) roaring—as He said they would be before He comes (Luke 21:25). Do not let your hearts be troubled, for the end is not yet. Yes, there will be wars and rumors of wars. This affirmation of Israel’s existence could ignite another war as it did in May 1948. I hear people saying daily that different actions by world leaders are going to start a war. My brothers and sisters, war must come to bring peace. Even when Jesus comes again, He will be coming as the God of war with His saintly army. After that Great War of Armageddon, there will be a 1,000-year reign of peace. Therefore, pray as we are instructed for the peace of Jerusalem—for when that peace comes, the hour of Jesus’ return is very near. Pray also for the Lord of the harvest to send laborers into the field, because the fields are white and ready for harvest. We need more laborers, and every time we win another soul, the laborers grow thereby bringing us closer to His appearing and the redemption of our mortal bodies! Hallelujah! Consider partnering with us in this great harvest. Michelle and I are daily in the fields bringing the message of biblical prophecy and the good news of Jesus’ soon return. Your financial support will make us go farther than we have in the past. Our God is the God of increase—allow Him to use you to bring it to the Body of Christ, including yourself. Thank you for all of you who support us in prayer, finances, and with your talents. We pray for your health, finances, and relationships to be richly increased and blessed, in Jesus’ name!